The headline says it all. At Bellator 214 last night, in the Bellator heavyweight grand prix final, Ryan Bader needed only 35 seconds to TKO Fedor Emelianenko. I mean, is this really a surprise to anyone? Fedor is long past his days of glory, when he was considered the best heavyweight in the world, bar none. And Bader, besides being a TUF winner and UFC vet, is Bellator light-heavyweight champ, so… yeah, this was going to happen. It still hurts, of course. It hurts anytime we have to see our heroes fight long past their prime, and it especially stings because it’s Fedor. Fedor was the man! Now, he’s a prime candidate for whatever CTE clinics they have going in Russia. The post Bellator 214 Results: Fedor Emelianenko Annihilated by Ryan Bader in 35 Seconds appeared first on Caged Insider. RECAP! Cejudo Decks Dillashaw In 32 Seconds! Ultimate Fighting Championship (UFC) talents TJ Dillashaw and Henry Cejudo battled for the Flyweight crown last night (Sat., Jan. 19, 2019) at UFC Fight Night 143 inside Barclays Center in Brooklyn, New York. The UFC’s new, earnest desire for super fights and double champs started 2019 off with an admittedly excellent match up. In one corner, collegiate wrestler and kickboxing specialist Dillashaw, an incredibly exciting fighter to watch who only recently retook control of his division. Opposite him was “The Messenger,” the most decorated wrestler in the sport, a man who captured the belt in 2017 by upsetting the sport’s most dominant champion. Furthermore, the result of this fight had a direct influence on the Flyweight division’s future. There was a lot on the line in Brooklyn. Miraculously, Cejudo lived up to the pressure put on him. The Olympian walked straight to his larger opponent, immediately belting him in the belly with a hard kick. From his Karate stance, Cejudo advanced, while Dillashaw switched his footing around and looked to throw in combination. Instead, Cejudo’s right hand slipped in behind the ear, causing Dillashaw to lose his balance and fall back. Cejudo swarmed with some seriously accurate ground strikes, continuing to whack Dillashaw’s jaw as he hung onto a takedown attempt. Dillashaw returned to his feet briefly, only to be put back down by more punches. 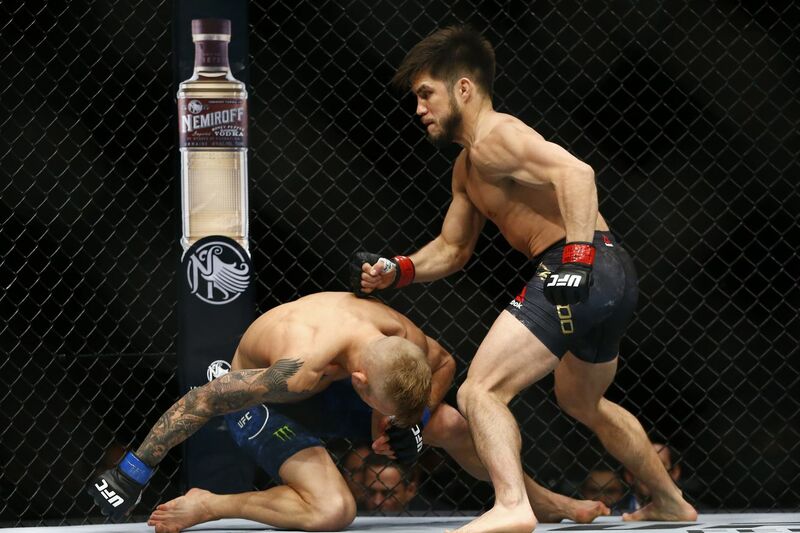 There would be no second return to his feet for the Bantamweight champion, as the referee stopped the bout when Cejudo began to land ground strikes a second time. The whole thing barely lasted 30 seconds. This was equal parts disaster for Dillashaw, incredible for the champion. It’s a remarkably bad look for Dillashaw. This is a man who repeatedly talked about how he would walk through Cejudo, how it wasn’t a challenge for him, and how he would fight Max Holloway for the Featherweight crown next. That’s a lot of talk to get put down twice in the first 30 seconds. Even aside from all that, it’s a miserable result for Dillashaw. Ignore all the interview quotes about the science and how easy it was to make 125 lbs. — that was a brutal, 12 week weight cut that Dillashaw will remember as a bad period of life for a long time to come. Dillashaw was forced to work extremely hard and remain almost inhumanly dedicated to make the weight; the payoff was a knockout loss. It’s a momentous win for the Flyweight champion, who really helped guarantee his division’s immediate future. Aside from that, beating Demetrious Johnson and TJ Dillashaw back-to-back? History won’t remember the arguments of “it was a bad decision!” or “Early stoppage!” Instead, it will see Cejudo taking victories over the two best of the absolute best lighter weight fighters of his era. It’s time for a title rematch with Joseph Benavidez. At UFC on ESPN+ 1, Henry Cejudo flattened his challenger in short fashion. What’s next for the Olympian? For complete UFC Fight Night 143 “Dillasahw vs. Cejudo” results and play-by-play, click HERE! On New Years Eve, superstar boxer Floyd Mayweather trekked to Japan to fight kickboxing stud Tenshin Nasukawa. It, uh, wasn’t even a remotely close match. It was, however, the easiest payday Mayweather has seen in a while. You know those Japanese – they’ll pay through the nose to see one of their countrymen get destroyed by a foreigner. Now Irish whiskey-maker Conor McGregor wants in on the action. I mean, poor Tenshin didn’t even last a full round with Mayweather, so how long could he last against McGregor in an MMA bout? For his part, Tenshin seems cool with the idea. Of course, he stipulates that McGregor will have to cut down to just under 128 pounds for that fight to happen. (Note: McGregor looks ghastly when he cuts down to 145 – ain’t now way he can make 128 pounds!) Also, kickboxing only, son.